If you’re a small, independent theatre company, how do you create buzz if a print review is still the key piece to filling seats in your market? That’s the problem facing Urban Arts Productions in Victoria, BC. I had the pleasure of seeing their recent production of Marie Antoinette: The Color of Flesh while visiting relatives in the city earlier this month. 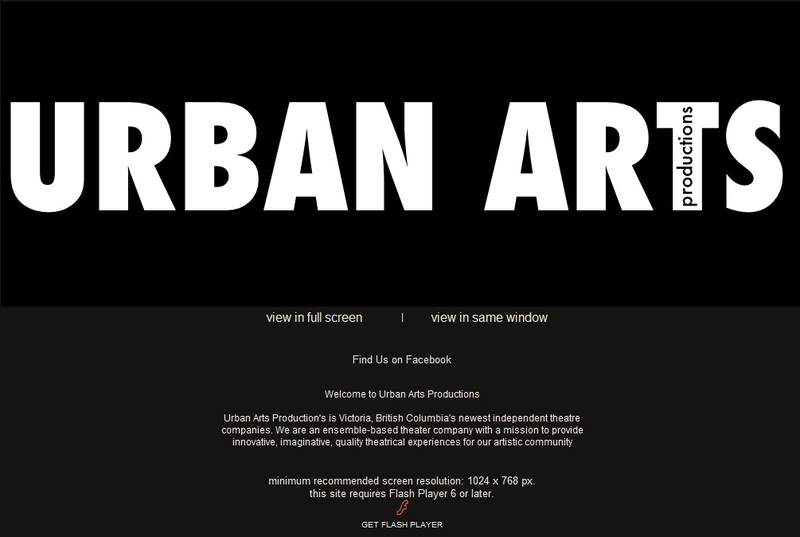 Homepage for Urban Arts Productions before you hit the cumbersome Flash. The three-actor show featured credible performances, a great script by Joel Gross, and minimalist (though acceptable) production values. 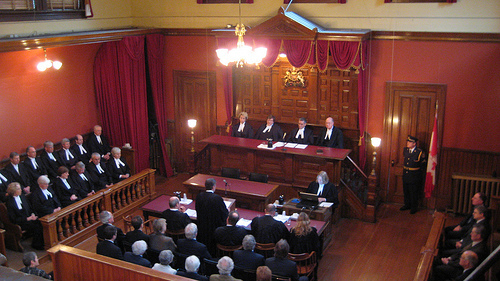 Its best feature was definitely the unusual setting — the restored Historic Victorian Courtroom in the city’s downtown Maritime Museum. We sat in the right-hand gallery out of the frame of this photo. Take out the central tables and the centre two rows of spectators, dress the judges’ table with props and you get a fair idea of the space. With just a railing separating us from the action, the actors were often mere inches from us, creating remarkable immediacy. Given the intimate portrait the play paints of France’s doomed queen, this was a unique selling point. Nevertheless, although we saw the show eight days into a 10-day run and there were only 11 people in the audience. 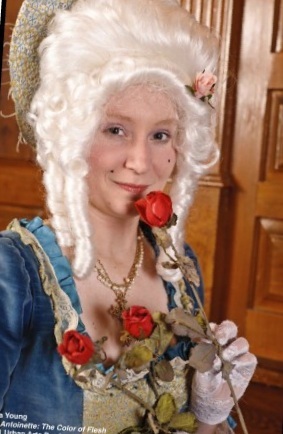 Andria Young as Marie Antoinette. Urban Arts’ production of Marie Antoinette received a positive descriptive article in the Times-Coloniston its opening Thursday; the print version included a large colour photo of the actor playing Marie in costume (see below). According to my relatives (who I should note are seniors and still rely, like many of their friends, on print publications for their local news), the Thursday arts section has the most extensive listings for the week ahead and had been carefully saved to help plan my visit. The only other play running the same night was the University of Victoria’s production of Shakespeare’s Twelfth Night. Although the review in Victoria’s Times-Colonist was decent, we decided it would be more fun to see a less traditional script done by a young (read hungry), professional company. Victoria’s substantial senior population provides fairly deep support for the arts. For example, we had also attended the Pacific Opera Victoria’s production of La Boheme three nights before seeing Marie Antoinette and the house was nearly full with an audience that wasn’t as grey-haired as you might expect. So why did only 11 people turn out given the space can accommodate up to an audience of 45? During the intermission, I fell into an informal discussion with co-director Heather Jarvie and several enthusiastic audience members, none of whom could believe the audience’s paltry size given the strength of the performances we’d seen thus far. Jarvie was matter-of-fact about the problem — in Victoria, you need a review in the local paper to ensure a good turnout. And, despite the company’s previous success staging Nevermore in the same space last season, they hadn’t secured one for Marie Antoinette. owned and operated by Postmedia Network Inc., Canada’s largest publisher by circulation of paid English-language daily newspapers. Its properties include daily newspapers in cities across Canada including the Vancouver Sun, The Province, the Calgary Herald, the Edmonton Journal, the Ottawa Citizen and the National Post, as well as more than 50 destination websites. A third of the stories are mainstream Hollywood and/or celebrity filler written by Reuters staff or other international newswire services. A third broadly cover Canadian arts and culture, but are written by Postmedia writers. The remaining third appear to be written by actual Times-Colonist reporters and cover local events. Cleverly, the paper’s online edition uses the local stories and their accompanying photos in prominent feature areas, such as the start of subsections like Stage, to make it look like the coverage is more local in focus than it actually is. So what’s Urban Arts doing about this publicity challenge? Their website has photos and production information. Their Facebook group has current content and includes a supportive plug from Joel Gross, the play’s author. They sent out a decent press release. Their production was listed in Culture Vulture Victoria, an online alternative news source for cultural events in the city, and positively reviewed (although the review appears to have been published after the run ended). Other online listings like this one also appeared in my Google search. They did get the overview article I mentioned in the Times-Colonist, if not the full review they wanted. What else can small production companies like Urban Arts do to improve their odds for positive word-of-mouth and, in this case, that elusive mainstream review? HI – I’m a bit mystified by your comments concerning my Twitter account (and your curious designation of my as “The Opposition”). Ninety-five percent of those following that Twitter feed are fans of a pug dog blog I write – they would be utterfly mystified to receive missives on Victoria theatre productions (many of the blog followers live in the United States). That feed is solely to publicize that particular blog – it has nothing to do with theatre, or what I think about theatre or its importance. As far as the theatre production in question goes, I think the company could do more to let me know about their shows… other companies certainly do. I’d be happy to review one or talk to them. And I would have been happy to talk to you for your article, if you had made the effort to contact me. I mean, I don’t want to tell you how to run your website, however suppose you added a post title to maybe get folk’s attention?